﻿ Clean Registry. Windows Registry. Scan Registry. Tweak Registry. Fix Registry. WinTools.net - software tools for MS Windows. 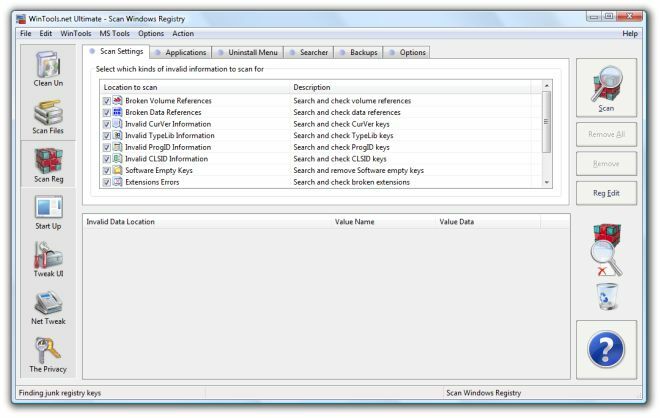 Clean Registry: Many programs store information about themselves in the Windows Registry. 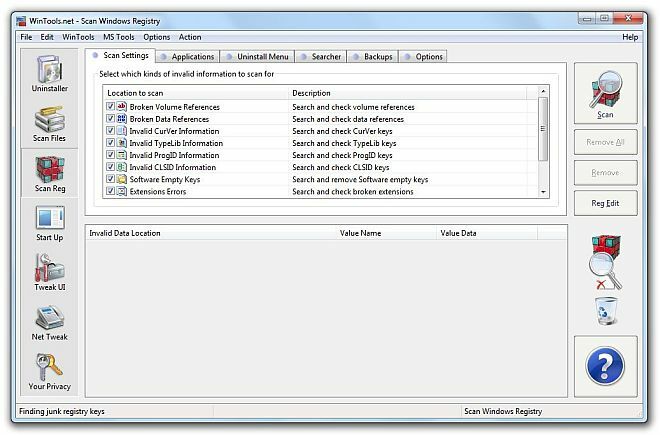 These programs add new file extension associations and install components of their own in the Windows Registry. 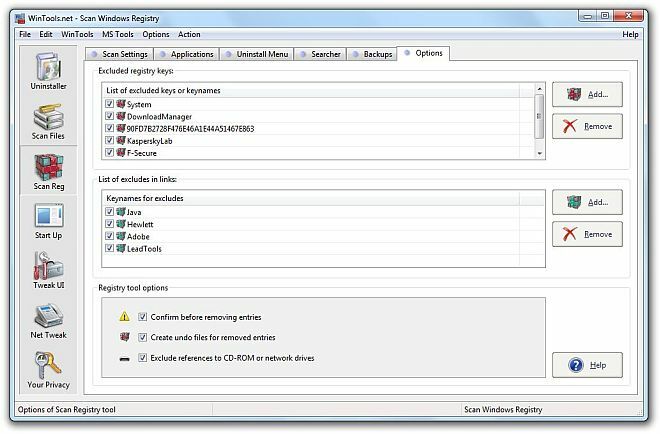 Far too often, the unistallation methods used by these programs fail to remove their information from the Windows registry adding unnecessary bloat. 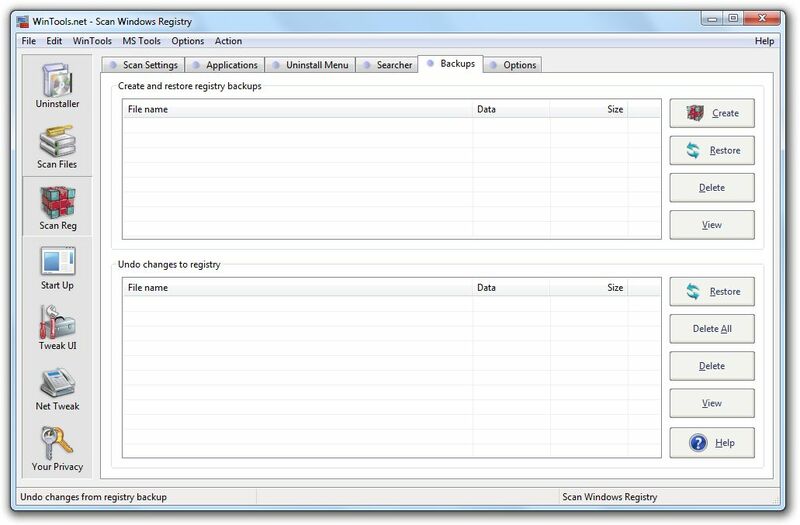 After several series of installation/uninstallation, the Windows registry becomes bigger and bigger; computer power declines and program access times increase. 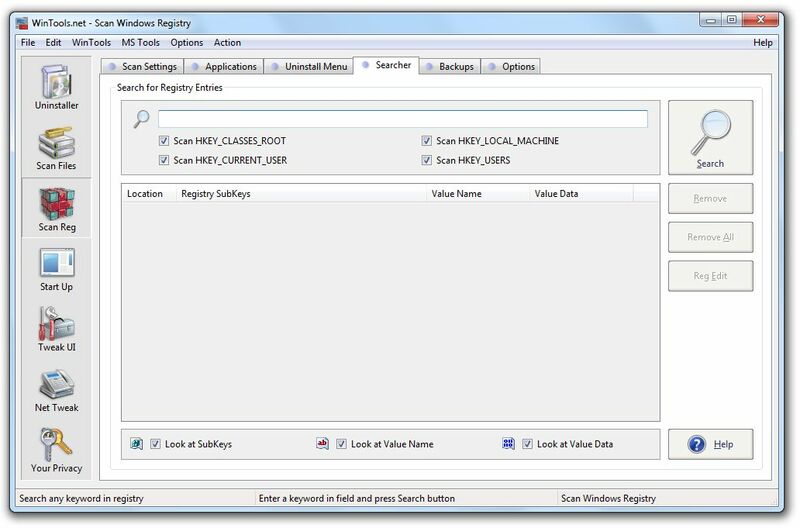 The Clean Registry tool serves for periodic cleaning of the Windows Registry and for correcting incorrect registry records. 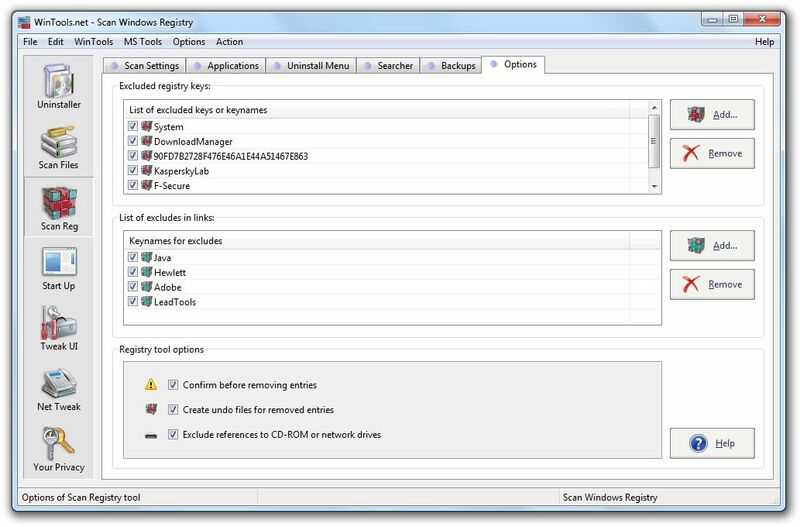 Before beginning of the work you need to choose the methods for scanning of the Windows Registry from list below "Choice of the methods for scanning". Then you can start scanning Windows Registry by pressing the "Start" button. Then you can delete unused Windows Registry keys by pressing the "Remove" button. 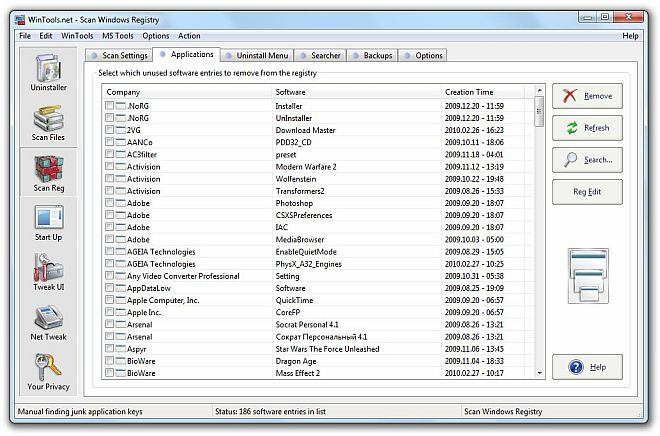 The Clean Registry tool contains six tool-tabs: Scan Settings, Applications, Uninstall Menu, Searcher, Backups, Options. Clean Registry: Software Entries - the Software Entries tab box keeps a list of the records in the Windows Registry. These records are created after the programs have been used. After uninstallation of the programs you need to check the list of the records. Records of uninstalled program remaining in this list indicate that the program was not completely uninstalled. You can delete these records from the Windows Registry using the "Remove" button of Clean Registry tool. 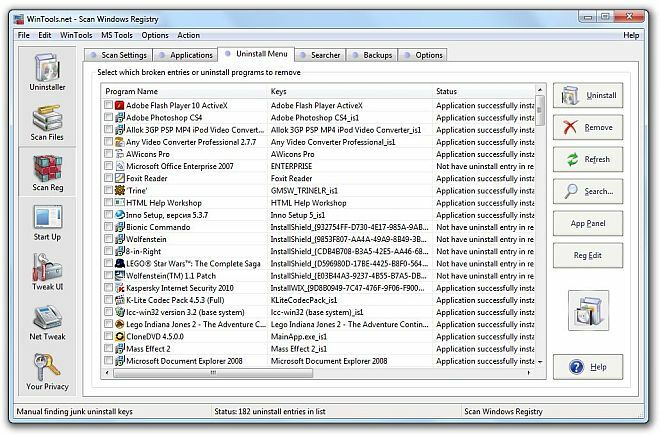 Clean Registry: Uninstall Menu - using this menu of Clean Registry tool you can uninstall the chosen program or delete the record about the program from the Windows Registry. Clean Registry: Searcher - this sub-tool of Clean Registry gives you possibility to search any keyword in the Windows registry. Clean Registry: Backups - this tool of Clean Registry gives you possibility to back up Windows Registry or restore changes of Windows Registry after registry keys deleting. 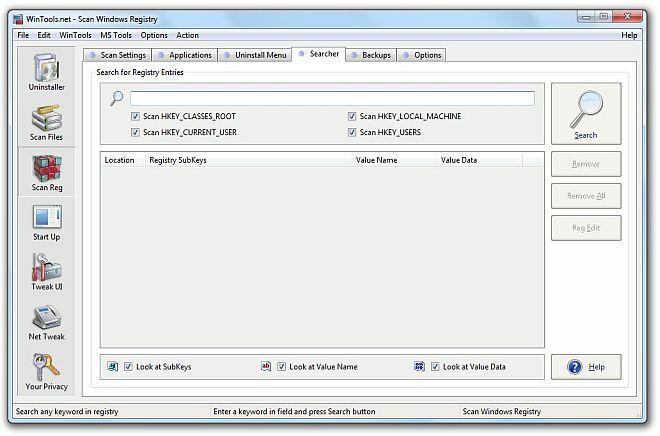 Clean Registry: Options - a lot of additional options which configure Clean Registry tool.